Maroon is a great accent color; it's easy on the eyes yet attracts attention. Like all of our plastic combs these range in size from 3/16 of an inch to 2 inches, and can fit any sized project up to 425 pages. The standard 19 ring design fits most comb binding machine and 8.5 x 11 inch paper. They are designed to lay flat in both an open and closed position. This smooth, glossy maroon won't scratch, chip, peel, or discolor. Which means your book will look great not only now, but years from now. 19 ring binding combs are standard and come 11" long. These combs are compatible with standard comb binding systems. Get 100pk on every order. Shiny Maroon plastic binding combs add a nice touch to your presentations. Standard 19 ring binding combs for 11" covers and documents. Bind from 10, up to a 425 sheet presentation with easy editable binding combs. Half size length of 8.5" for 15 hole comb binding. Easily add or remove pages of your presentation, our combs will hold from 10 to 425 sheets. Our binding combs work with any standard comb binding system. 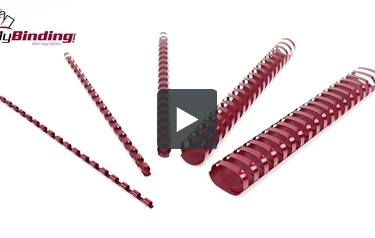 Glossy Maroon plastic binding combs complement your covers for a professional appearance. 24 ring binding combs for 14" covers and documents. Welcome to MyBinding video. I must admit, maroon is a difficult color to sell. I mean look, it looks so great on our own bindings but we figured we have a full warehouse so we might as well share. Ranging from 3/16" to 2", there's a comb for any sized project. These maroon plastic binding combs have a smooth and glossy texture, which is perfect for the day-to-day project. Additionally they won't scratch, chip, peel or discolor. The 19-hole punch patter is compatible to fit any standard comb binding machine and not only that, they're made to use 8 1/2 x 11 inch paper, which means anything you print, you can make into a book. And depending on your choice of size, you can fit any number of pages from 1 sheet to 425 sheets of paper, which means it will work for most any project. Proper use allows for pages to flip easy and lay flat, making reading a breeze and allows for getting the right margins for photocopy. These are some pretty slick plastic binding combs. For more demo's, reviews and how-to's, go to MyBinding.com.